As we approach Asya, anchored outside Naples’ Mergellina Port, the yacht, with her muscular and streamlined elegance, stands out from the rest of the boats sweetly pitching in the shiny, choppy sea. The silhouette of Capri in the background adds drama to the view. 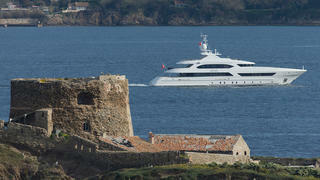 Asya immediately recalls Heesen’s renowned and successful style offered in different sizes and configurations. The yard and Frank Laupman of Omega Architects, the brand’s designer of reference for years, came up with exterior designs that, by general consent, catch the right combination of innovation and continuity. Asya is no exception. 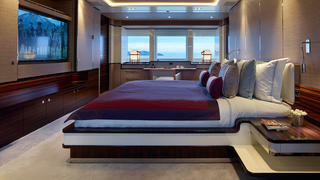 Despite not being a “one of a kind” yacht — she belongs to the successful full-displacement 47-metre series —Asya features a custom layout and interior design and is only the second unit of the series to have been meticulously modified to comply with the latest LY3 rules and the Maritime Labour Convention (MLC). Her crew accommodation is larger and more comfortable than in the previous yachts of the series and equipped with as many amenities as possible. 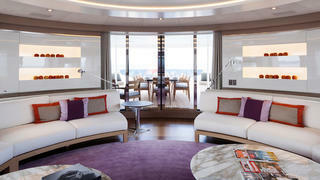 In profile, her Heesen hallmark “pelican” bow is enhanced by continuous, well-shaped glass windows. A mature design, the 47-metre features vertical wheelhouse windows that provide shade and rain protection while allowing the designers to maximise interior space. Originally called Project He, the steel-hulled yacht was already under construction when her owner purchased her. Heesen starts construction of a limited number of yachts on speculation every year to provide an opportunity for potential clients to minimise delivery time while maintaining an appropriate level of productivity for the yard. Asya was handed over in March 2015 and sailed on her maiden voyage soon afterward. 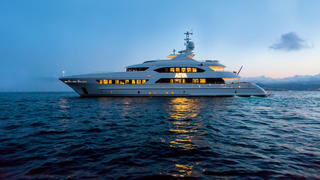 The owner and his family will use her extensively on both short and long cruises. She is not offered for charter. She is the sixth yacht London-based Bannenberg & Rowell has designed for Heesen, following Elandess 2 (now Raasta) in 2008, the 37-metre all-aluminium Aurelia in 2011, the 47-metre My Secret and Lady Petra, both launched in 2012, and the second largest Heesen to date, the 65-metre Galactica Star, launched in 2013. The studio’s seventh and eighth interior projects for the yard are already in the pipeline. 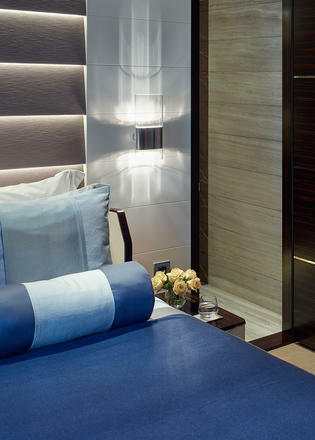 Dickie Bannenberg adds: “We were working on an Asian-inspired interior design for Project He, as agreed with the yard, when the owner stepped in. He liked it overall but asked for changes, which turned her into a truly custom project with a fresh, graceful style.” Spaciousness and relaxation are the key themes both inside and out. 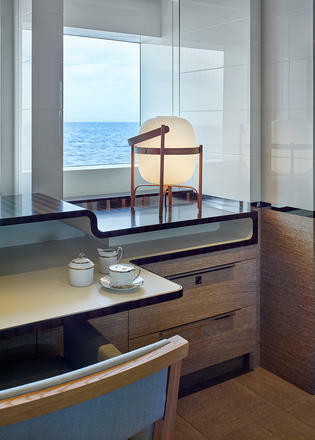 The interior concept for Asya was inspired and underpinned by the stripped-back aesthetic of Dieter Rams, Frank Lloyd Wright and Tadao Ando, say the designers. A further reference, which was used as a creative “lens” by the studio, was Wright’s observation that to get the most enjoyable result, form and function should be one, joined in a spiritual union. “Armed with these guiding principles, we added a top layer based on the lean aesthetic of minimalist Far Eastern resorts to produce a restful and discreet environment,” says Bannenberg. Throughout Asya, a delicate palette spanning all the nuances from white through light beige to brown is enhanced by mid-gloss white lacquered surfaces and bronze details, while contrast is provided by dark Makassar ebony with highly polished stainless-steel detailing. The silver-grey oiled oak used on all the decks provides a warm and soft feeling. 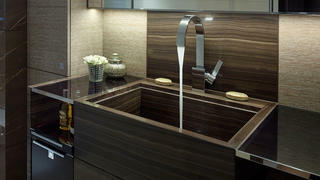 Another key aspect is the tactile experience provided by the decoration. 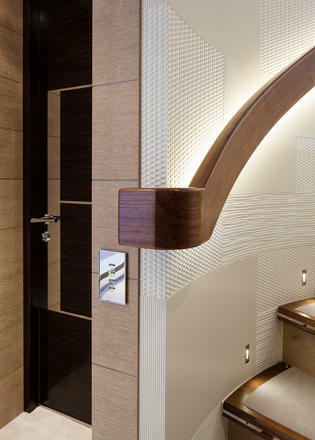 Simple in their geometric shapes, white textured leather panels decorate Asya’s main staircase wall. 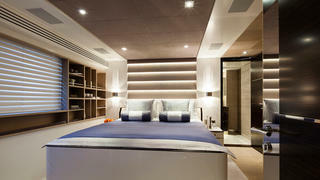 Headboards and bulkheads such as the one in the dining area are made of hand-hewn wood. Despite their simplicity, the panels create an art-gallery effect without overwhelming the pure and low-key decor. The rough, uneven surfaces invite touch. Asya’s design philosophy extends to all areas, including the guest en suites, where striped marbles in neutral tones are coupled with lacquered surfaces, silver-grey oak and Makassar ebony. A tour of the decks leaves one impressed by the cleanliness and cohesiveness of the style and the attention to detail for which both designers and builder are renowned. 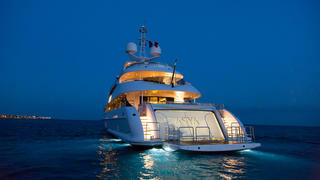 Stepping aboard Asya from the 6.8-metre Dariel custom tender, the overall feeling of quality is immediately striking. The main saloon on Asya features three subtly divided living areas. Entering through the aft door, a library-like space is framed by book niches, some of which are protected by coloured-glass doors and underlined by polished stainless-steel details. The library leads to the seating area, which is furnished with two Maxalto Simplex sofas by B&B Italia. Guests on Asya can also relax on comfortable Aster X armchairs by Poltrona Frau or lounge on a pair of padded chaises longues by bespoke Italian manufacturer Meridiani. In the original concept there was a partition between the seating and dining areas of the multi-function saloon, but the owner chose to change to an airy, open-plan environment. 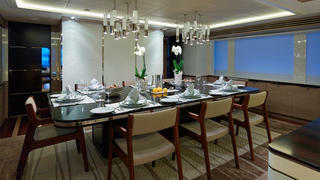 At the forward end of Asya’s saloon, the imposing dining table with its shiny Makassar ebony top can seat up to 12. Daily life on Asya takes place mostly outside or in the panoramic bridge-deck saloon, an informal and extremely comfortable room whose layout breaks the orthogonal geometry we have seen up to now. Following the superstructure curve, the interior design enhances the saloon’s spaciousness. A large circular ceiling detail unifies the design and the layout of the furniture. A round games table, two C-shaped sofas, a circular rug and coffee tables respect the geometry of the room, which turns into a cinema for the family when the large television is switched on. Concealed behind a door to starboard is a bar and wine room. 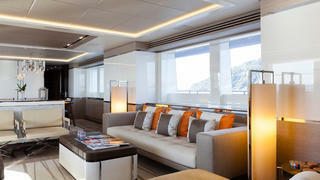 Asya’s lower deck houses four guest cabins amidships — two doubles and two large twins — which are arranged along a cosy lobby and present the same decor and style featured above. Silver-grey oak joinery provides a warm atmosphere, while cabinetry and bedside cabinets feature ebony tops and bases sandwiching a cool off-white lacquer. Asya’s family-friendly character extends outdoors to areas such as the main aft deck, which offers a large lounging area, and the upper deck terrace, which is equipped with an alfresco dining space. 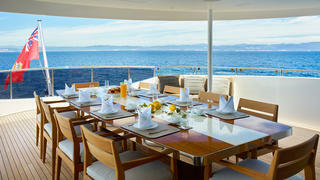 Higher still, the sundeck provides sufficient space and amenities to enjoy life at sea en plein air. 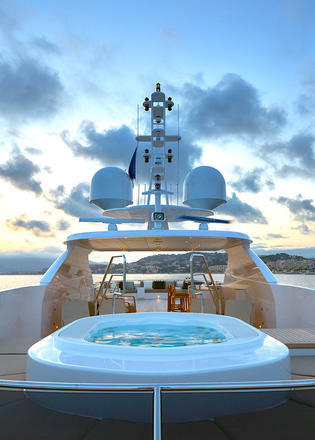 With its panoramic superyacht spa pool forward, and a fully equipped bar, sunbeds and C-shaped sofa abaft, this deck is the right spot to relax under the sun or stars. 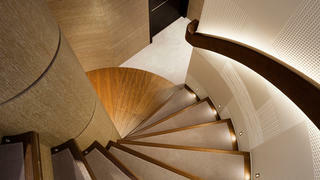 Asya’s stairs are protected by steel and glass barriers and gates for the safety of the owner’s children. Descending to the technical area, accessible from both the garage and side corridor on the main deck, the engine room on Asya is an outstanding example of the yard’s abilities and approach to quality. While engine-room spaciousness is not a Heesen hallmark — it prefers to give more space to guest areas — all the machinery is properly positioned and easily reachable for routine use and maintenance. A fully equipped laundry is accessed through the control room. A displacement, round-bilge motor yacht with bulbous bow, Asya has twin MTU 8V 4000 M63 engines that provide a top speed of 15 knots at half load. On several occasions the yacht has exceeded the contractual maximum speed and offers a range of 4,000 nautical miles at 12 knots. 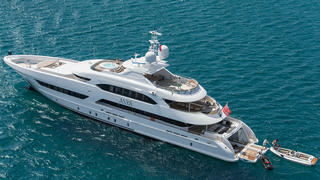 The yacht is equipped with Heesen’s standard machinery and navigation and communication instruments as the owner didn’t feel any changes were necessary to the specified package.